Awareness and joint action by the government, owners and workers can ensure occupational health care and safety at workplaces. 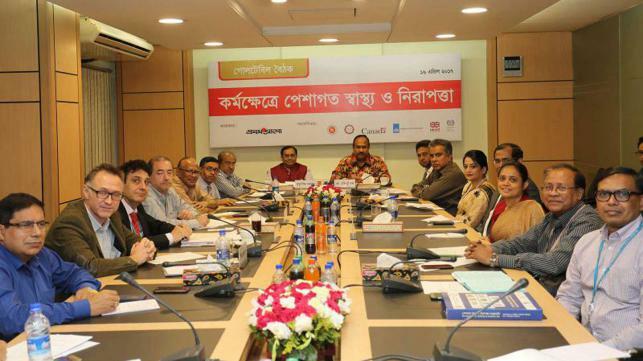 With Occupational Safety And Health (OSH) Day coming up on 28 April, discussants at a roundtable on ‘Occupational Health and Safety at Workplace’ organised by Prothom Alo on Sunday, came up with the recommendation. The state minister also said there were a lot of laws in the country related to the issue. “If it is been implemented fully, that’s not a problem, but it’s not an easy job. “If we can make the workers, owners and general people aware, we can succeed. People are not aware of about fire safety and other security measures, OSH. After the Rana Plaza tragedy, people became more serious about the matter. “Inspection cannot be the most important issue. We need awareness. Once awareness is in place, things will be easier,” he added. Steve Needham, senior communications officer at the Dhaka office of the International Labour Organisation (ILO), said Bangladesh has made remarkable progress in the last few years and the progress continues. “So many things have already been done but it has not finished as yet. More is required to be done in this regard,” the ILO officer added. He also said not only the garments sector, but other sectors that can be benefited by this. “We need to focus on small and medium factories in terms of occupational safety,” he added. He suggested that trade unions and women entrepreneurs can play important roles in this regard. Mohammed Nasir, vice president of the Bangladesh Garments Manufacturers and Exporters Associations (BGMEA), praised the women workers who constituted 70 per cent of the 4.4 million garment workers at the beginning. Asked about safety in small and medium industries, he said, in terms of small and medium industries, there are problems. The small factories are not capable of affording the costs of safety measures in their factories. He also said Bangladesh is a role model in the world concerning safety at the workplace. He said the BGMEA is very much amicable with labour issues and has taken it very seriously. “BGMEA, jointly with the government and BKMEA, is trying to sanction ‘soft-loans’ to ensure safety measures. “We are continuing training on safety issues as 175 masters, who trained 8000 supervisors, and the supervisors gave training to 800 thousand workers on health issues. We have hospitals in the Dhaka and Chittagong to provide health assistance to the garment workers. There are funds for nursing mothers and thousands of mothers got Tk 500 each from the mother fund,” he added. Wazedul Islam Khan, general secretary of the Bangladesh Trade Union, said this was a very important issue. It’s true, he said, quoting the state minister for labour and employment, that the number of the factory inspectors has been increased. But nothing will work until the owners become aware of labour safety. Asked about trade union’s role in workplace safety, he said, trade unions can help strengthen the safety committee. He also mentioned that there were some technical problems such as loan conditions and interest rates for the small industries to avail safety funds. If it was made easier, they can benefit from that too. She demanded increased compensation for workers who fall victim of workplaces accidents. “We see owners are afraid of the trade unions leaders, but it shouldn’t be like that. “Owners and workers both must work for the occupational safety and health. That is the bottom line,” he added. He also said industrial development will not be possible ignoring workers. Public and private models to ensure occupational health and safety can be introduced as participation of the workers through trainings is a must. Selima Ahmed, president of the Bangladesh Women Chambers and Commerce, said safety awareness among women workers should be raised, breaking stereotypes. She pointed out courage is big problem while the factories are being inspected for the safety issue. Prothom Alo associate editor Abdul Qayyum moderated the roundtable programme.